5 tips for marathon recovery to get you back up to racing speed. Why is marathon recovery so important? Yes, I will need to recover from those crazy mountain like hills I just ran up at the Kingdom Marathon. A week and a half ago I was the women’s winner at the Kingdom Marathon. Since then I have been taking it “easy” and letting my body recover because I’ll be running the CHaD Hero Half Marathon on October 26th. In the past I have often jumped back into training too quickly after a marathon and my body has rapidly reminded me to slow down by throwing me into sickness. Another reason to take marathon recovery seriously is to avoid injury. No one wants to be sidelined with an injury (believe me I know firsthand!). 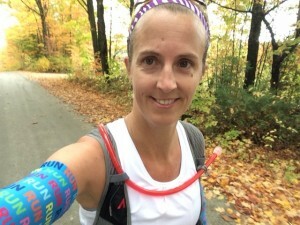 I have been racing a lot this fall and after the Kingdom Marathon I knew I needed to take it easy. My legs actually recovered fairly quickly from the marathon but my body was noticeably fatigued. I have been feeling extra exhausted and have been needing more rest than usual. Also, I have been feeling a bit blue with my big goal races being done for the fall. I want to be feeling like a superhero at the half marathon, ready to fly down the course for 13.1 miles (which should hopefully feel like a breeze after conquering the crazy hills at the Kingdom Marathon). Check out Organic Runner Mom’s 5 tips for better marathon recovery to get you back up to racing speed. Here is what I have been doing to effectively recover from the marathon so that I can feel energized and ready to go on at the half marathon. Extra zzzzz’s. Kick your feet up. It’s time to relax. Squeeze in a power nap if you can or try to get to bed an extra half hour earlier than usual. Mixing it up. I have done a little bit of running but have been focusing mostly on cross-training to give my muscles extra time to recover. My favorite ways to cross-train–cycling, swimming, yoga, and hiking. Hydrate. Hydrate. Hydrate. I often fail to do enough of this anyway and we all know how great fluid loss can be during a marathon so rehydration is extra important the day of and the days after the marathon. Also, staying well hydrated can help prevent fatigue! The best way to stay hydrated is to always keep a filled water bottle at your side. Focus on things that are positive! I am prone to depression anyways (and with daylight hours waning in New Hampshire, seasonal affective disorder or S.A.D. is setting in) so after a marathon I always tend to feel a bit blue. Accomplishing a great goal is such a high but when the event is over their can be sadness associated with final goal being over. In order to stay positive I spend recovery time focusing on fun with my kids and my family. 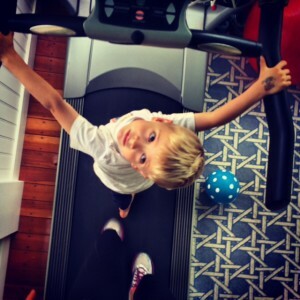 We have been going for great walks, playing tons of silly games and during a day when my daughter was sick my silly son even joined me for some treadmill time. This is also a great time to start dreaming up those next big race dreams in order to refocus and to start building a new training plan either on your own or with a coach. How could this cutie pie not put a smile on your face? What are your best tips for marathon recovery? 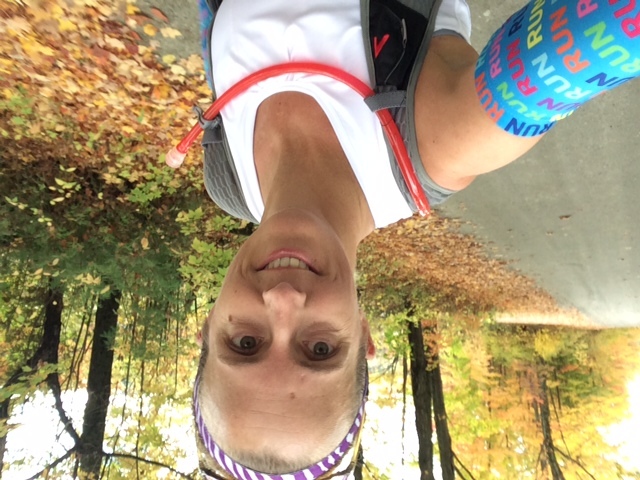 Thanks for sharing – I just ran a hilly trail marathon on Saturday and am having a hard time deciding what I need for recovery. This advice is certainly helpful (and timely)! Great tips! I need to remember these when I finally take the marathon plunge! I’ve never run a marathon BUT I can honestly say sleep sleep and hydration are imperative. I have several friends who run halfs and fulls every quarter it seems and they say that is what helped them rebuild and recover. Great tips! !